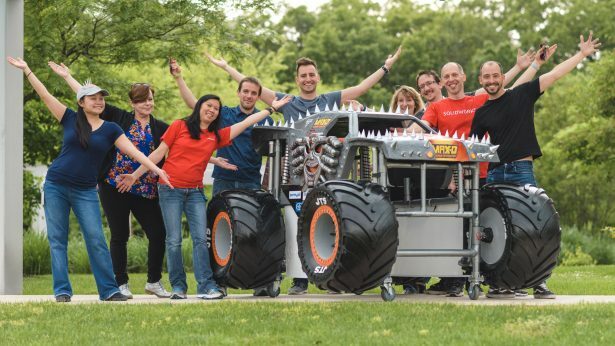 Update 10/29/18: Listen to our latest Solidworks Podcast on the Monster Truck Magic Wheelchair. 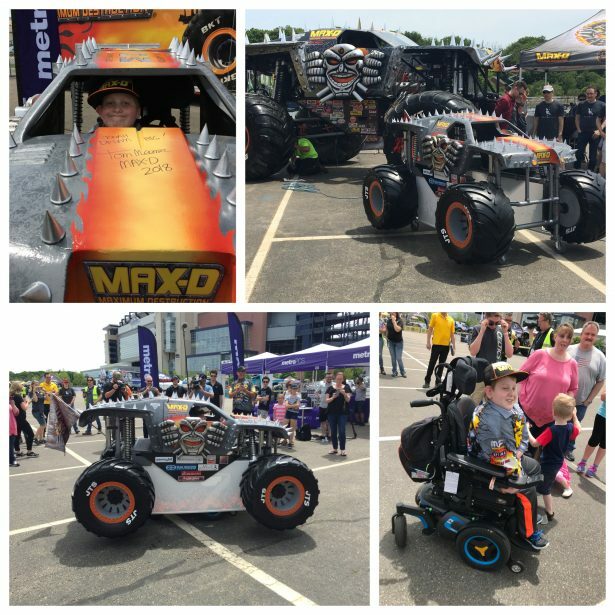 It was a beautiful day in Foxboro on Saturday, June 9, and monster trucks were abound. 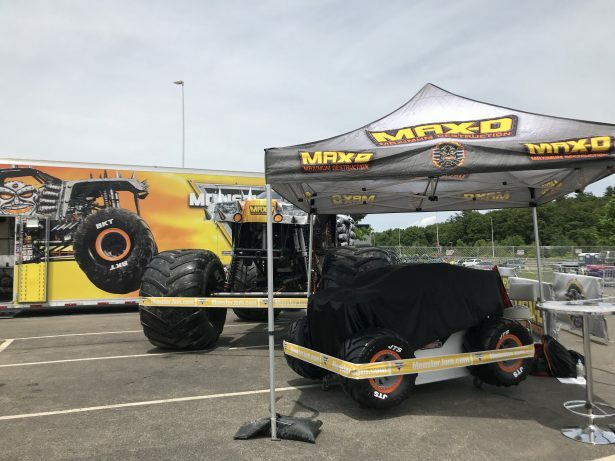 In a parking lot next to Gillette Stadium, fourteen trucks and their drivers were getting ready for the Monster Jam Pit Party to begin, the mammoth machines shining in the sunlight. Among the trucks was Max-D, sitting massive and proud next to its trailer. And next to Max-D, at a 42.42% scale, sat the mini-Max-D, waiting to be revealed. After six long weeks, after untold hours working late into the night, the SOLIDWORKS Magic Wheelchair build team reached their deadline and had one heck of a product to show for it. Jonah’s mini-Max-D was perfectly painted, with massive wheels, acrylic flames lit by fiery LEDs, a color-changing LED trim shining along the bottom, a sponsor panel featuring actual sponsors (including, of course, Jonah’s Monster Jamer Youtube Channel), and hyper-realistic spikes and rivets. In fact, as the team pulled their cars into the monster truck parking lot and started constructing the costume at noon, they realized the mini-Max-D was beyond realistic. When finally faced with the real life Max-D, the build team discovered that some of the details they’d put into the costume were, well, too detailed. “Stickers?” cried Annie Cheung, staring at the “rivets” on the real Max-D. “We could have used stickers?” Indeed, the 3D rivets she’d worked so hard to produce, that she designed, 3D printed, and attached to the body individually, were, in fact, stickers pasted to the sides of the real Max-D. 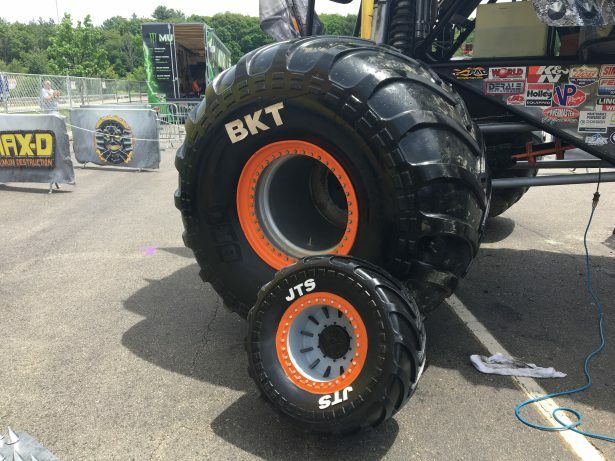 So were the BKT letters on the monster truck’s tires. Albert Hernandez, who’d spent countless hours iterating the wheels for the mini-Max-D, just laughed. The protruding foam JTS’s (Jonah’s initials) he’d designed, cut, painted, and pasted onto the costume’s tires could have been stickers the whole time. The team’s attention to actual size, scale, and detail is a testament to their passion and excitement for the project, and for making Jonah the happiest boy in the world. As the team got to work putting the costume together for the reveal, Max-D driver Tom Meents came over to introduce himself. Tom is the original Max-D driver, Jonah’s favorite driver, and his enthusiasm for the project is part of what made the reveal so big. He thanked the build team for their hard work and marveled at the mini-Max-D. Monster Jam head announcer Ryan Lacrosse also came over to admire Jonah’s costume and the team’s work. The epic reveal would not have been possible without the support of Monster Jam and Feld Entertainment. Their excitement over giving Jonah an amazing day was only matched by their organization and professionalism in putting the day together. And what a day it was. The SOLIDWORKS build team covered the mini-Max-D with a black cloth and rolled it under Max-D’s autograph-signing tent to keep it out of the heat. When workers came to wrap the real Max-D in Monster Jam branded caution tape (to ward off anyone trying to touch the truck), team leader Chinloo Lama sprang into action and asked for the mini-Max-D to be wrapped up too! Then it was time to wait for Jonah’s family to arrive. For the past few years, Jonah’s family has attended the Pit Party at Monster Jam. This year, though, they got to go in early. While the Pit Party, a carnival-like event where fans can meet their favorite drivers and see the trucks up close, started at 2PM, Jonah got to come in at 1PM. He was told his family had lucked into an earlier meet-up time. In fact, they’d lucked into something much greater. Joined by his parents and four of his siblings, Jonah was surprised to see the SOLIDWORKS team standing next to Max-D. He was especially surprised to see their specially made baseball caps, decked out with mohawks made of spikes and a patch that read “JONAH’S PIT CREW.” As Jonah reached the small crowd around Max-D, Chinloo, Tom, and Magic Wheelchair Regional Director David Vogel went out to greet him. SOLIDWORKS gave Jonah a swag bag, complete with a Max-D button up shirt that matched Tom’s, and Jonah put the shirt on immediately. Then Tom went one step further and gave Jonah a special Max-D hat, so Jonah could be a real driver. While Jonah and his family met Tom and chatted, the SOLIDWORKS Facebook Live crew got in place and the build team/pit crew moved the costume out into the sunlight. Finally, it was time for the big moment. Jonah couldn’t believe what was in front of him. The mini-Max-D! Complete! Ready for him! And in only six short weeks! He thought maybe he’d be lucky enough to see a prototype of the costume at Monster Jam, not a finished product. “How did you do that so fast?” he exclaimed. As the team reconstructed the costume around Jonah and his wheelchair, I asked Tom what he thought. “This is awesome,” he said, shaking his head in disbelief and grinning. You’d be crazy not to agree. Jonah fit perfectly into his tiny truck, and the full costume stuck to his wheelchair like glue—no lag, no wobbling, nothing. He was able to reach his max speed and brake, he was able to do donuts, he looked like a real monster truck and he even jokingly yelled to his sister, “I’m going to run you over!” And that was just the beginning. Tom Meents signing a Max-D spike. The other one is already on Jonah’s hood. 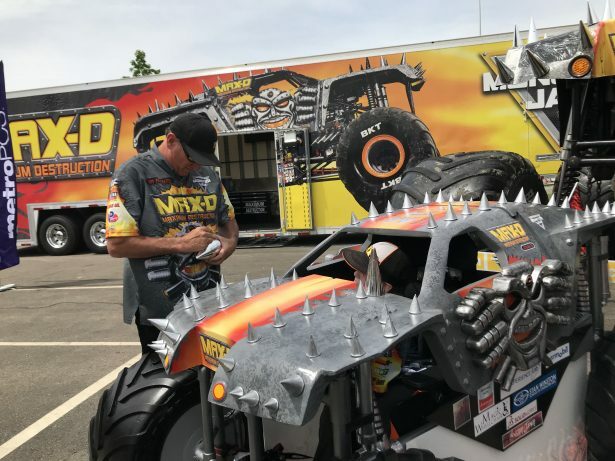 As Chinloo explained all the details of the mini-Max-D to the newest mini-Monster Jam driver, Tom disappeared into his trailer and reappeared with two actual spikes from his truck. The real Max-D’s spikes were gigantic, and Tom signed the two different sized spikes for Jonah to take home with him. Tom also signed the “hood” of Jonah’s costume, much to Jonah’s delight. “Look at him over there, he’s orchestrating,” said Kathy, Jonah’s mother, as Jonah chatted with the various camera crews surrounding him. Jonah was a natural in front of all the cameras at the reveal (SOLIDWORKS, Monster Jam, and Fox Sports 1). “Hello TV!” he called out as he drove past. This attention was just a taste of the celebrity Jonah would be faced with. At 2PM, the pit party began, and Jonah and his family started exploring the rest of the lot, meeting other drivers. It was hard though—everywhere Jonah went, he was stopped by a fan, or a monster truck driver, and asked about his costume. 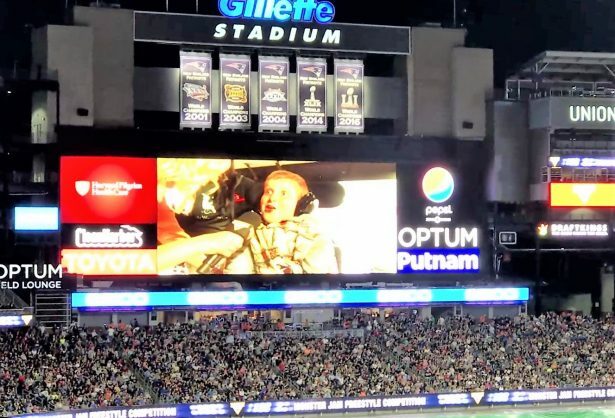 That was one of his quotes in his live interview during Monster Jam itself, on Gillette Stadium’s Jumbo Tron. As a final component to his epic day, Jonah was interviewed right before the freestyle event began. He was joined by Chinloo and David from Magic Wheelchair, and the sold out stadium watched him and got to hear about his costume, Magic Wheelchair, and SOLIDWORKS. It was an amazing day for an amazing kiddo. And Jonah’s pit crew? Before Jonah’s family went into the stadium to find their seats for the 7PM show, the build team helped Jonah out of his costume and packed it away in their cars. The costume went back to SOLIDWORKS so they could hard coat the hood to preserve Tom’s signature for Jonah. The team also wants to add a mechanism so Jonah can control the LED lights on his car in the future, and they need to write down specific instructions so Jonah’s parents can help him put on the costume by themselves. After loading the costume into the cars, the build team all sat together in the stands at Gillette and finally got a chance to relax and enjoy the show. Every time Max-D came out, the build team cheered. And when crowed roared while Jonah was up on the big screen, the group of people clad in Magic Wheelchair shirts screamed the loudest. The Monster Jam costume and reveal would not have been possible without the hard work of dozens of people. There’s the build team themselves: Chinloo Lama (team leader, detailing artist), Sal Lama (foam fabricator), Annie Cheung (foreman of the build, did everything), Rob Jost (body designer, self-proclaimed “coolest team member”), Albert Hernandez (inventor of the wheel, colorful aerosol texture artiste, part-time Zoolander impersonator), Nicolas Lefebvre (LEDs and electronics), Julian Galgoczy (sander of CNC’s foam parts, general build helper, legit Monster Jam fan), Jeff Turgeon (creator of faux suspension, sanded his fingerprints off in the making of this project, also a legit Monster Jam fan), Eben Gay (wheel motors), Heather Snider (costuming and fabrics), Kathy Howard (dashboard designer), Santiago Laverde (in-house CNC milling expert), and Jody Stiles (frame design advisor). There are the community teams that helped put the reveal together: Rachel York (Facebook Live host and reveal organizer) and Alison Visconti (Rachel’s right hand lady) from SOLIDWORKS, and the force of nature that is Monster Jam/Feld Entertainment, including Sallie Palmieri, Amanda Regan, and Tom Meents. There are the people behind the scenes at SOLIDWORKS: Marie Planchard (SOLIDWORKS Director of Education), Abhishek Bali (3DEXPERIENCE Lab Manager), and Sara Junghans (SOLIDWORKS Senior Product Portfolio Manager). The wonderful crew at Magic Wheelchair, including David Vogel and Christine Getman. Permobil for providing the team with the CAD files for Jonah’s wheelchair. 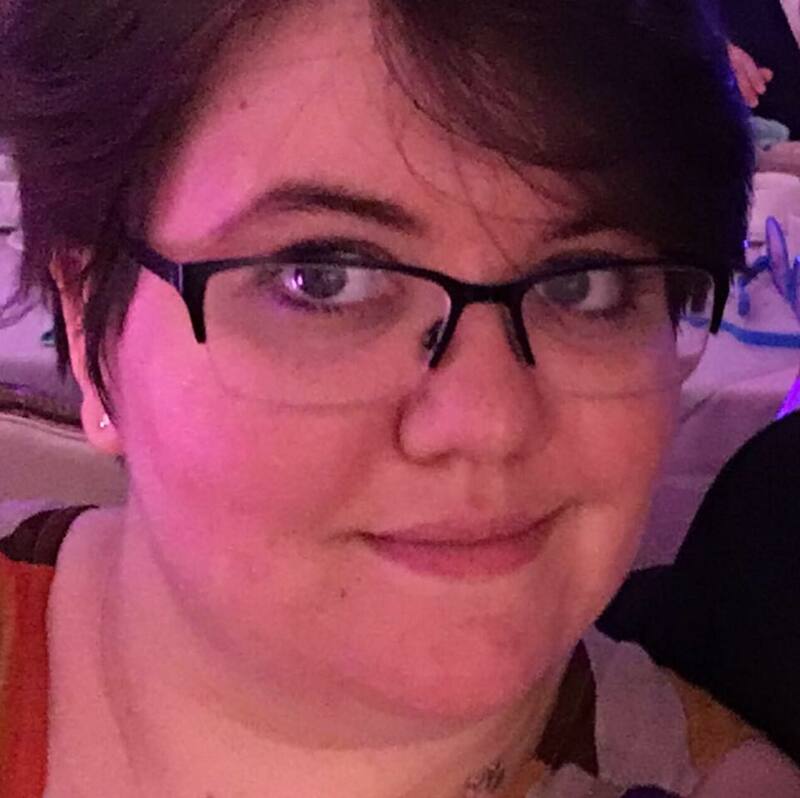 All the marvelous Magic Wheelchair donators, who gave money to this incredible non-profit in Jonah’s name through his classy.com page, and shared the news of this build with so many people. And, of course, Jonah and his lovely, amazing family. Making this special for them was the best part of the whole project. There’s still more to come from SOLIDWORKS and Magic Wheelchair. If you missed our Facebook Live reveal, you can watch all of the videos here. You can still donate to Magic Wheelchair in Jonah’s name. And you can watch out for some monster follow up. SOLIDWORKS’s first Magic Wheelchair build was an amazing success and we’ve got more on the way for you. Keep an eye on this space for more Jonah-rific content and, as always, keep on (monster) truckin’! Read about Jonah’s costume from the beginning! Learn more about the build process by reading other articles in this series!